The Higher Education Policy Institute and the University of Buckingham have worked with YouthSight on a survey of attitudes towards drugs among full-time undergraduate students. The research shows a majority of students think illegal drugs cause problems for individuals and society – 88% think drug usage causes problems ‘for the mental health of the user’ and 68% think it causes problems ‘for society in terms of contributing to criminality’. 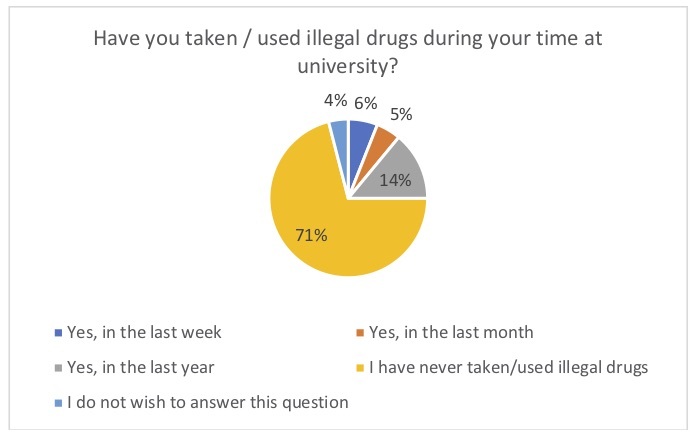 A majority of students want their university to take a tougher stance on ‘students who repeatedly use drugs’ (62%) and on ‘drug dealers’ (also 62%). Nearly three-quarters (71%) of students have not taken illegal drugs during their time in higher education. The findings contrast with a report from the National Union of Students (NUS) and Release, published in April 2018, that suggested most students (56%) had taken drugs and nearly two-thirds (62%) ‘showed relaxed attitudes towards student drug use’. The two studies have different methodologies: while the NUS survey was targeted at specific groups (such as ‘Students for Sensible Drug Policy UK channels’), the new survey used YouthSight’s large Student Panel, with the results being weighted to reflect the body of full-time undergraduate students. This survey provides an important corrective to some of the wilder ideas about today’s students. They are more hardworking and less hedonistic than is often supposed. A majority recognise the dangers of taking illegal substances. Some people blame universities when they become involved in students’ personal lives. Others blame them for not doing enough. Our survey shows most students support their institutions taking a tougher, rather than a more relaxed, line on the use of illegal substances by fellow students. With illegal drugs, we have been fiddling while Rome burns. Illegal drug-taking causes mental health problems, and is a symptom of them. Even students themselves think there needs to be a stronger lead on drug-dealing, especially as the survey shows many students feel under peer pressure to participate in illegal drugs. My own University, Buckingham, is trying to become the country’s first drug-free university, by changing the culture to one with the emphasis on drugs education, peer pressure not to take drugs and encouraging alternative strategies to drugs and excessive alcohol for relaxation and enjoyment. Most students (71%) have not taken illegal drugs during their time in higher education, but one-quarter (25%) have done so in the past year. Three-quarters (74%) of female students have not taken illegal drugs compared to only around two-thirds (68%) of male students. Among students who have taken illegal drugs in higher education, nearly half (47%) feel under peer pressure to take illegal drugs. Eight-out-of-ten (81%) of those who taken illegal drugs while in higher education say they have done so for recreational purposes and only 6% say it is to cope ‘with difficulties with exams’. Around four-in-10 students (39%) say there is a problem with drugs at their higher education institution, with slightly more (44%) saying there is not. 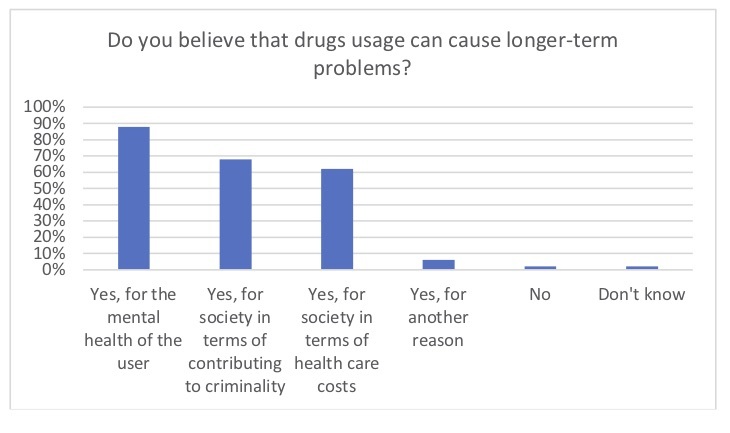 When asked whether drug use ‘can cause longer-term problems’, only 2% say ‘No’, with 88% saying ‘Yes, for the mental health of the user’, 68% saying ‘Yes, for society in terms of contributing to criminality’ and 62% saying ‘Yes, for society in terms of health care costs’. Female students are more likely to report concern for the effect of illegal drugs (92%) on the mental health of users than males (83%). Most students (53%) say their university does not do enough to deter illegal drug use, while one-in-five (19%) disagree, with the rest (27%) opting for ‘Don’t know’. One-quarter of male students (25%) say their university does enough to deter illegal drug taking but only 15% of female students take the same view. More students (44%) think ‘excessive alcohol’ use is a ‘very serious’ threat to students than consider ‘illegal drugs’ to be (33%). In addition, 43% regard ‘excessive alcohol’ to be ‘quite serious’ and 12% ‘a little serious’ and only 1% opt for ‘not serious at all; 44% regard ‘illegal drugs’ to be ‘quite serious’, 20% ‘a little serious’ and just 3% ‘not serious at all’. One quarter (26%) of students think neither ‘better information and education’ nor ‘tougher punishments’ would discourage students from taking illegal drugs, but 41% think ‘better information and education’ would be the best approach and 33% think ‘tougher punishments’ would be the best approach. 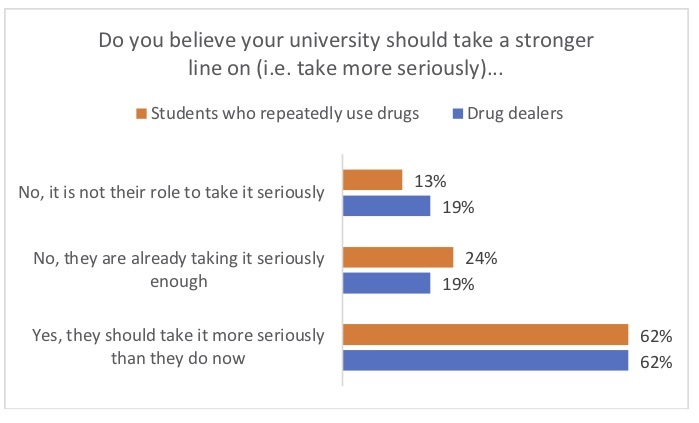 A large majority of students (62%) want their university to ‘take a stronger line’ on drug dealers, against just 19% who think their institution is already taking the issue ‘seriously enough’ and a further 19% who think it is not the responsibility of institutions. Most students (62%) also think their university should take ‘a stronger line’ on ‘students who repeatedly use drugs’, made up of two-thirds (67%) of female students and 56% of male students. 29% of male students think their university already takes the issue seriously enough, compared to 21% of female students. HEPI and the University of Buckingham jointly sponsored Wave 5 of the HEPI/YouthSight Monitor, which was answered by 1,059 full-time undergraduate students and undertaken in the final week of May. The margin of error is +/-4%, based on a 95% confidence level (or +/-7% for the two questions reserved for those who have taken illegal drugs during their time in higher education). Where the results are presented differently for men and women, the differences are statistically significant. The full results, including for questions not covered in this press release, are available here. HEPI is hosting two debates at the University of Buckingham Festival of Higher Education: one on 13 June 2018 about academic selection; and another on 14 June 2018 on how many people should have the chance to attend higher education. Further information is available at http://www.hefestival.com. I suspect students don’t consider alcohol and cannabis to be ‘drugs’; they’ve become normalized. My gut instinct is that this research was politically motivated…. even the headline of the article is quite leading. The sample was taken from one university, and whatever methodology you use, you have to factor into the equation that fact that students that do take drugs will probably not want to reveal that in their university’s environment. This is very much out of touch with the views of most students across all UK universities, and it feels as though someone somewhere wanted some stats to be able to refute the views of young people on legalization. I wouldn’t be surprised if this is used down the line as evidence against legalisation. I don’t see any evidence that all the respondents attend the same University (I presume you mean Univ of Buckingham). Still, this sample may not be representative of the wider student body, but then again neither might the sampling carried out by the NUS. Students who are active in (or even positively disposed to) the NUS are likely to be more leftist than the mainstream. Without wider polling we will not be able to judge the true position. Thanks Bill. To clarify one point, the sample was not taken from one university, as is clear on the spreadsheet.